A creative, technical and entrepreneurial minds have been mixed in my persona. Well, I guess if I lose my mind, the remained two will keep me going on two-thirds of my potential. My first job after college was a puppet maker for a state puppet theatre called by its founder, a famous then puppeteer Obraztsov. The job had some creative flavor in it but mostly engineering — I developed mechanisms for the actors to be able to operate the puppet characters synchronously with their voice over. In the Soviet Army. Thanks to my background, as a disciplinary action I was ordered to hammer an incuse pattern upon the ceiling of the training camp cafeteria. This camp is located on the territory of a different country now. I wonder, if the ceiling is still there, one day it probably will be a confusing founding for the archeologists to annotate. My friend helped me to get a real job of a set developer for the stop-motion animation production at the state animation studio, Soyuzmultfilm. It was like creating the shooting sets for real movies just in miniature — I had a lot of fun. Here is one of the short films with my credits for the production set. The studio closed its doors during Perestroika. The socialism was "de facto" dead, but there was no capitalism "de jure" yet — it was a weird time, I learned how to cook tons of different dishes using a single ingredient, potato. 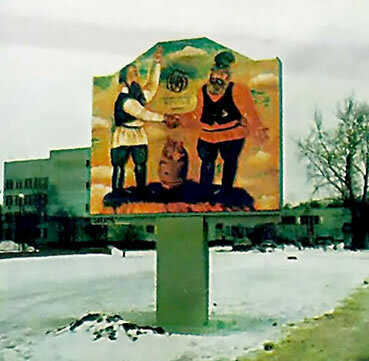 Many think that advertising didn't exist in USSR. This is not entirely correct — the government enterprises paid a small advertising tax that went to the budgets of the state industry-specialized advertising agencies. 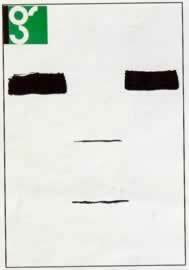 It was mostly print and posters that helped me as I was able to feed myself working as a freelance graphic designer for a couple of state advertising agencies when many people could not find any jobs in the collapsing soviet economy. 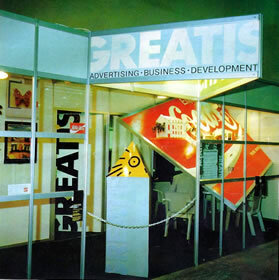 In 1987 I founded advertising agency, Greatis, one of the first private agencies in USSR. 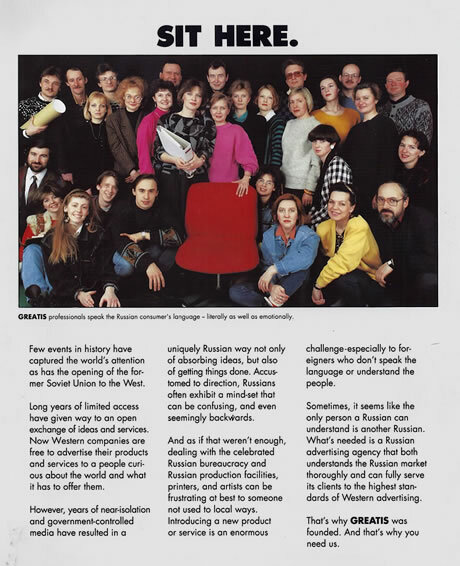 In 1993, with 110 people, it became one of the two largest agencies sharing 50% of the advertising market in Russia. 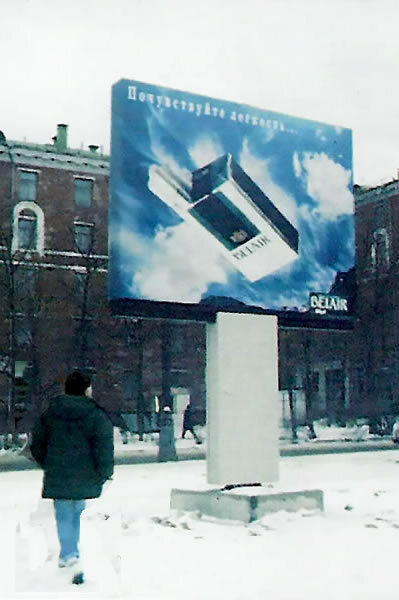 In 1989 Moscow government allowed me to buid a few billboards to test the people's reaction — most Russians never seen billboards before. They even let me put one at the corner of the Red Square. 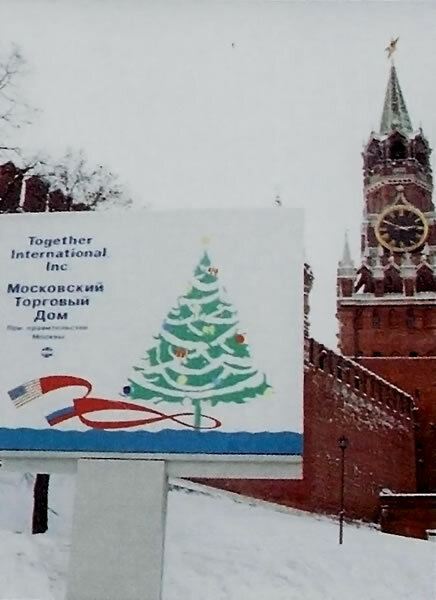 My good friend's father was a military radar engineer and helped me to design a billboard structure that could sustain strong Moscow winter winds while being economical in production. In five years I built one of the largest billboard network in Moscow. Unfortunately, the changes in the regulation sponsored by the corrupted officials and mafia involvement essentially turned this business into a nightmare. 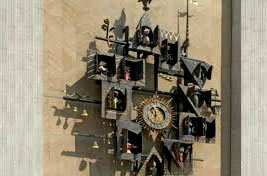 It was big, indeed, because it was the first wallboard of such scale in Moscow. 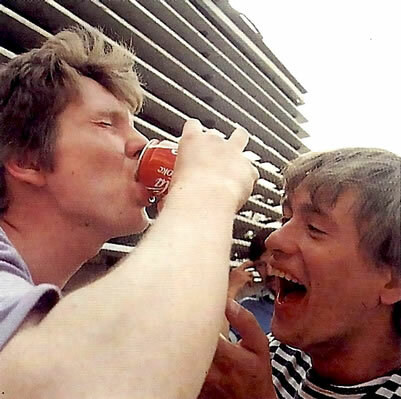 Commissioned by Coca-Cola, it made history. 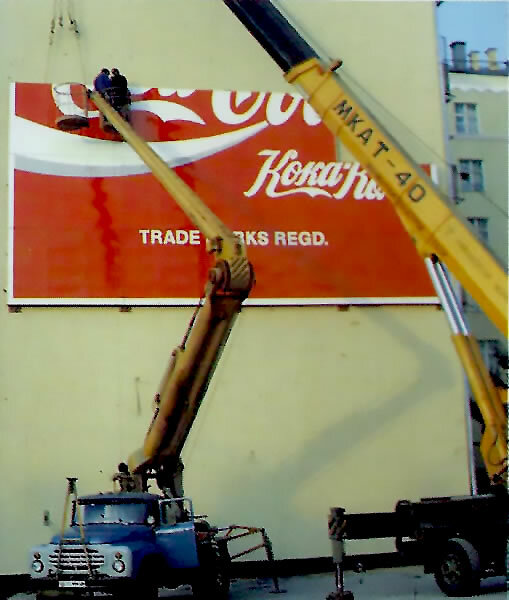 Ironically, it probably benefited Pepsi more on a sales side because Coca-Cola was not available in many stores yet, but Pepsi was around from 1980 Moscow Olympics. Many Russians were convinced that the liquid in both bottles was actually the same, but Pepsi was less addictive because it didn't contain cocaine. One thing was new for advertising in Russia — in 1991 instead of just informing about products and services I started using TV, outdoor and print in coordinated media-buying programs. The goal was to start building brands. In a high-demand-for-everything market and very low media-buying rates we built brands probably faster than the "brands" built any business — it was super exiting as any campaign was literally doomed to succeed. In USSR TV ads exist mostly in a form of announcement by a TV anchor. The first TV commercials made in USSR using the stop-motion animation techique and ran nationally were made for one of the first private banks, Russian Exchange Bank. First convention of advertising industry in Moscow. It became apparent that privately-owned agencies grew up and dominated the market while the state-owned agencies have became mostly obsolete. I start publishing the first private magazine on visual arts in Russia, Greatis Magazine. I would probably never do it by myself, but a nice and effective editorial team of talented and enthusiastic people approached me with the idea and I thought that it could be a great educational and share information tool for the new to the open market creative people. 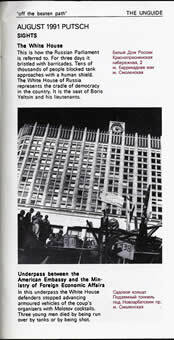 The 1991 Soviet Coup, also known as the August Putsch, by its failure helped the open market economy to overcome. A demand for political campaigns had come and I was grateful to implement the fist successful one. 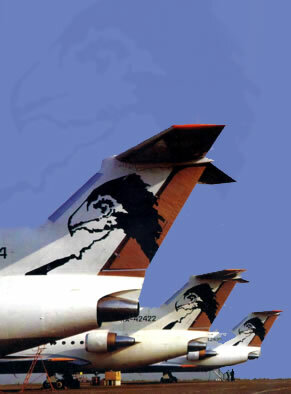 Orel (eagle) Avia was one of the first private airlines. Its president, Tatevos Surinov, gave me a sketch of the logo made on the napkins — he was super excited of his own idea. I wasn't sure what to do with that but I liked the smirk of the eagle. So it was transferred from the napkins directly to the airplane tails with no modifications. 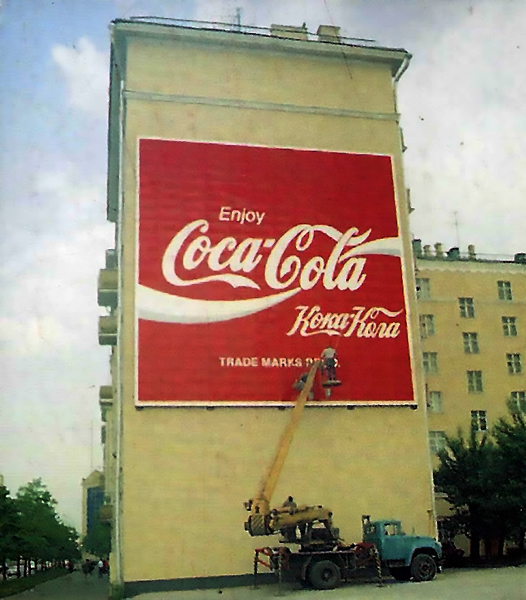 The first wallboard on a major square in Moscow has been built, and yes, it was commissioned by Coca-Cola. Even if you made a fair amount of business in rubles, only dollars could help to feel "rich". 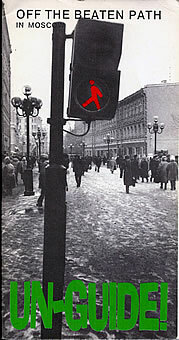 Un-guide was designed for foreign tourists and had more connections with the culture of the original "Russkie" than the Soviet guides published by the Ministry of Culture. It was tempting to create a campaign featuring a famous personality. 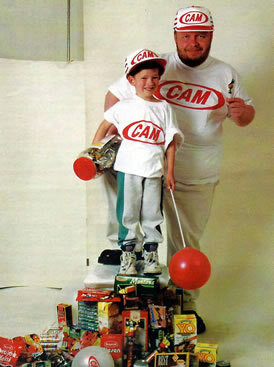 We didn't have stars in a sense of what it means in America, so we invited Sergey Krylov, a singer well-recognized because of his complexion, for a grocery-store chain campaign (CAM). Sergey didn't have any complexes and even runs a club with a slogan "Fat Man of all countries, unite!" An optimistic approach worked and we won the Best Campaign in Russia award. My love to stop-motion animation made me to start producing animations on my own. I commissioned a script based on "Cabbages and Kings" (a 1904 novel written by O. Henry) and built a team of talented artists and animators to make a full length production. The movie was finished after I moved to U.S. and I still hope to implement one day the English language version. 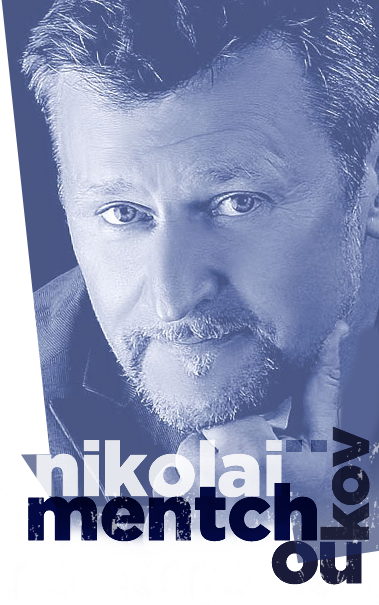 In 1992 I founded Moscow International Biennale of Graphic Design Golden Bee.This project happened to become so successful that the festival continues to takes place after I left the country in 1996 and keeps running by the same team which started it more than 20 years ago. Today Golden Bee is one of the most important events in the world's professional calendar. About 15,000 artworks from 60 countries have been submitted to Golden Bee 11 (2014) making it arguably the world's largest award-exhibition of that kind. Submit your poster to Golden Bee 2016. 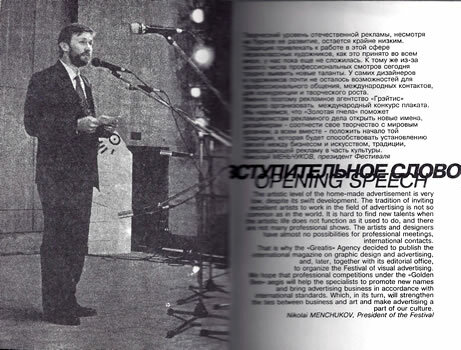 Opening speech on the first Moscow International Biennale of Graphic Design Golden Bee. 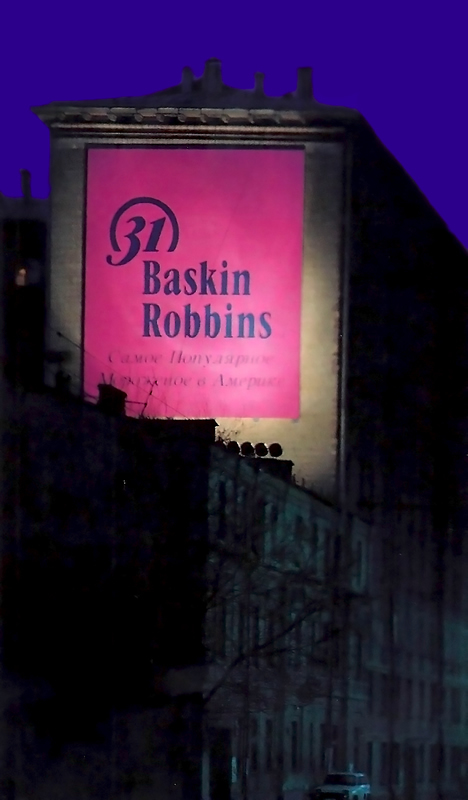 In 1993 one of the challenges was to incorporate some lighting capability so the billboards could provide more advertising value during long Moscow winter nights. Once the electrification have been figured out, the Moscow winter nights became most beneficial factor for the outdoor advertisements — it was the only thing you could see out there. Now of course it looks very basic, but that's how it started. It is kinda embarrassing to acknowledge now that I made advertising campaigns for some cigarette brands. Well, some of them were successful. But to be fair, at that time people allowed to smoke seating in McDonalds. These were the best advertising lessons though I had in my life and I probably learned from them more than I learned working on a political party campaign during the first democratic congressional elections in Russia that year. Ironically, the cigarette brands and the political party ended same way in history. There is a satirical similarity between the fate of that cigarette brand and the fate of that political party. Here I am on one of the first "dot com" convention in Boston. In 1998 I got so excited working on creative for the internet businesses and discovering for myself technology so I couldn't think about doing anything else in my life anymore. The "traditional" life I lived had abruptly ended and an entirely new "interactive" life have started literally from scratch, pretty much at the same time with the birth of the online advertising field. It's like I still building billboards, making ads and commercials, just this time all digital. Later I learned that I actually started from a wrong part — I should've started with building a technology for broadcasting the ads instead of making them first. On the other hand, because of a necessity to fix that mistake, ten years later I de facto became the Father of Viewable Impression. 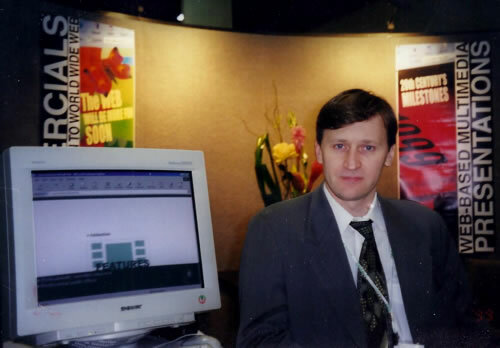 In 1999 I came up with an idea of a new form of advertising to the web in a form of Webmercials. Before video became available on the Internet, Webmercials were made in Flash as 15-20 second animations placed as a gate intro to the webpage. These ads could also use sound and high-quality vector graphics to display the message even over 28.8k modem connection with no loading time. It was before I developed any distribution technology and, unfortunately, at that time I did not have actually any ad serving option to offer for a managed cross-website distribution of these ads. Banner had prevailed for the next fifteen years — well, temporarily. The first ad introducing the Viewable Impression metrics technology to the market (Advertising Age, October 11, 2010.) In 2008 working as CTO for RealVu, I introduced the Viewable Impression technology to MRC. I managed to run through the audit required for the first accreditation of the Viewable Impression metrics technology by MRC in 2009. In June of 2011 Viewability formally established as a 3MS (Making Measurement Make Sense) priority, and in March 2014 MRC announced lift of advisory for transacting on viewable impressions (effective immediately for display advertising, lifted on June 30 for video ads).